A marble sarcophagus in which a young Roman man and then a show business pug (retired) were laid to their putative eternal rest could not perform its duties. The remains of both are long gone, and the coffin sold for its handsomely stark design, good condition and its checkered past. Young Gaius’ family could afford an expensive marble sarcophagus and a prime burial location. It was unearthed in 1828 on the Appia near the tomb of Cecilia Metella by Richard Temple-Nugent-Brydges-Chandos-Grenville, 1st Duke of Buckingham and Chandos. The grandson of one Prime Minister (George Grenville) and nephew of another (William Grenville), Richard Grenville was an Oxford alumn, Member of Parliament, Privy Councillor, Knight of the Garter and holder of a number of other sinecure positions granted by his uncle. He’d already climbed the political ladder as far as he could be bothered and squandered absurd amount of cash on a variety of dissipated pursuits when he hit the continent for the Grand Tour. He was past 50, so not your usual British Grand Tourist. More like a fugitive from irate creditors. Still he spent, indulging his penchant for archaeology by excavating the burial sites outside the walls of Rome. Gaius Messius Sequmdinus’ sarcophagus was a good enough find to schlep all the way back to Buckinghamshire. His remains, on the other hand, were left behind. In 1837, Gaius Messius’ coffin was pressed into service again when the Duke’s beloved pug Harlequin died of advanced old age. The Duke was inconsolable over the loss of his dog. Harlequin was placed in the sarcophagus and buried on the grounds of Stowe House, seat of the Dukes of Buckingham. Unfortunately for the pug (and for the family, I suppose) the next Duke of Buckingham was as terrible with money as his father had been. He was such a spendthrift that by 1847 he was forced to take a page out of Daddy’s book and run to Europe to dodge the creditors he owed a million a half pounds. The next year there was nowhere left to run and the patrimony of the Grenvilles and of all those heiresses whose maiden names got integrated into the hyper-hyphenation was sold to the highest bidder in a much-celebrated auction at Stowe. The sarcophagus is listed as a lot in the catalogue, but it’s almost incidental. The real star is Harlequin. A Roman sarcophagus, found by the late Duke of Buckingham, in an excavation made by him at Rome, in 1828, near the tomb of Cecilia Metella. It then contained the skeleton of the Roman youth whose name it bears – the bones of which were carefully replaced in the earth. It recently stood in the flower-garden at Stowe, and in it were deposited the remains of the late Duke’s favorite dog, who died of extreme old age in 1837. This trifling circumstance is mentioned because to all the Duke’s numerous visitors and friends, this little dog Harlequin was well known as a most sagacious and intelligent little animal; and his attachment to his master was very extraordinary. He was a native of Bologna, of a very rare family called the red-nosed pugs. He was small in stature, but of the utmost symmetry of form. His latter years were embittered by the effects of a quarrel with a large poodle, arising from jealousy, and in this encounter, he lost one of his eyes, by a bite from his furious rival. When the Duke met with him at Bologna, he was a chief actor in a travelling showman’s company; but he could be seldom prevailed upon to display his talents in dancing, after he was purchased from his former master, and promoted into a higher grade of society. It wouldn’t do to have an actor in the family donchaknow. Fortune-dissipating wastrels, sure. We’ll crank those by the score until there’s nothing left to squander, but a trained dancer is a step too far. 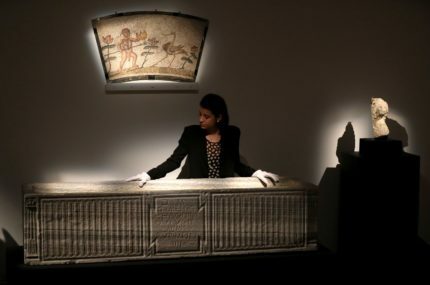 The sarcophagus sold at Sotheby’s Ancient Sculpture sale on Tuesday for £40,000 ($51,000) edging out the high side of the pre-sale estimate by £5,000.